No matter what your weather outside, these little sunny babies will bring a ray of sunshine right in. Preheat oven to 375 degrees. Bring lemon juice to a simmer in a small saucepan over medium heat; cook until reduced by half. Add 1 stick butter; stir until melted. Whisk together flour, baking powder, and salt. Cream remaining stick butter and 1 cup sugar on medium speed in the bowl of an electric mixer fitted with the paddle attachment. Mix in egg and lemon butter. Mix until pale, about 3 minutes. Mix in vanilla and 2 teaspoons zest. Mix in flour mixture and poppy seeds. Stir together remaining 1/2 cup sugar and 1 1/2 teaspoons zest. Roll spoonfuls of dough into 1 1/2-inch balls; roll them in sugar mixture. Place 2 inches apart on baking sheets. Press each with the flat end of a glass dipped in sugar mixture until 1/4 inch thick. Sprinkle with seeds. Hi Laura! I absolutely love everything poppy seed. These cookies look wonderful. Thanks for sharing with the newbie party. Love it! My mother-in-law is staying with us for two weeks and she loves lemon. Definitely going to make these for her. Hi Laura! I love Lemon Poppy Seed cookies, but have never tried making them at home. Thanks so much for sharing your recipe so my family can try them. Yours look very yummy indeed. I appreciate you visiting Your Cozy Home Party this week! Beautiful photo - I've enjoyed exploring your blog today! I cannot wait to try this recipe!! Maybe for Mother's Day...but I'll have to make them on Saturday because I will be doing NOTHING on Sunday! Thanks for linking up! I love Lemon Poppyseed Cake, I bet these cookies are delicious! 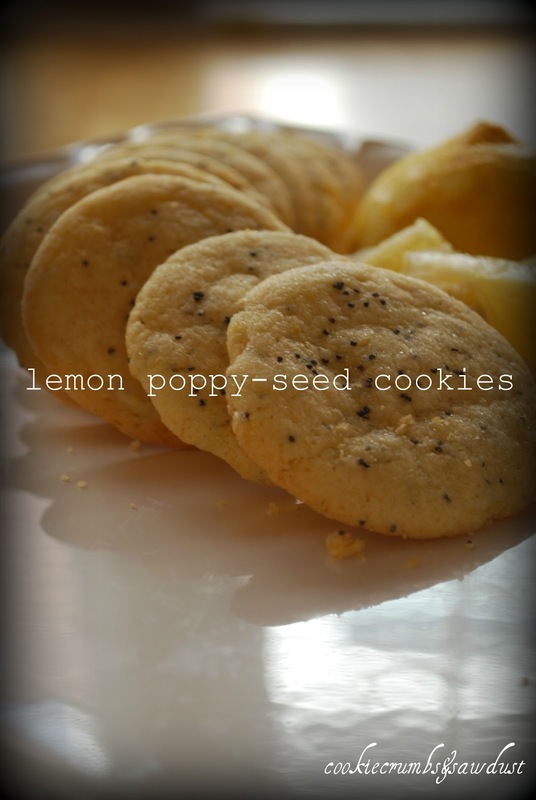 I love lemon and Poppyseed so I'm sure I'll love these delicious looking cookies. Thanks so much for linking up to Creative Thursday this week. I can't wait to see what you link up next week. Have a wonderful weekend. I haven't had lemon poppy seed anything for ages and this sounds so good! Happy hopping! These look divine! Aren't Martha's recipes amazing? Thanks so much for sharing on Tout It Tuesday! Love this...I was just about to make a lemon poppyseed loaf! Thanks for linking up to Southern Sundays. These look delish! I have a recipe for lemon-poppy seed loaves. I'll have to try these. Thank you for sharing on Saturday Show and Tell. I hope you'll share with us this week. Thanks for linking up to last weeks party! I have another one up and running today. Looking forward to seeing what you have to share.